The exhibition in which this work was shown was dedicated to contemporary artists’ covers of a variety of pre-existing works, literary, musical or otherwise. 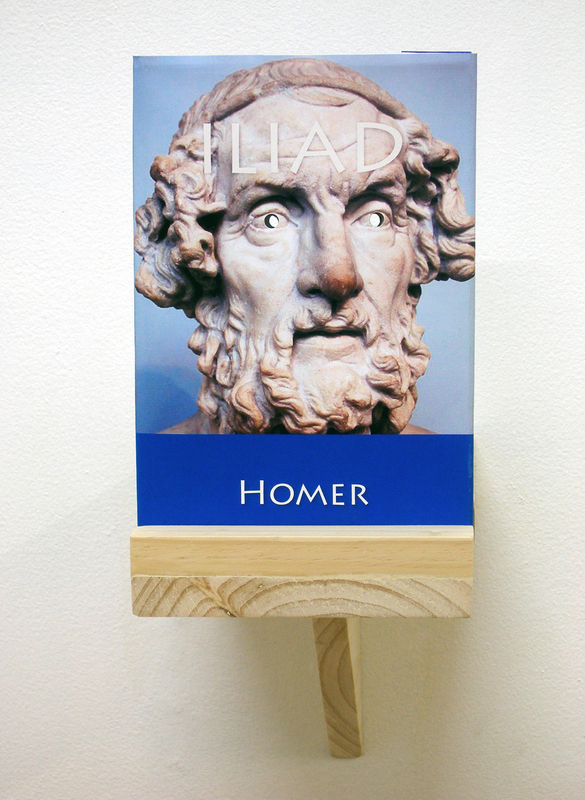 Homer, the famous blind Greek poet and author of those ancient ‘road-movie’ scripts ‘The Odyssey’ and ‘The Iliad’ provides the starting point for this particular work. Of course, the paradox of the blind author who sees the world with his ‘inner’ eye is theoretically well-documented. Still, Homer’s works instead of reveling in interiority, are dedicated rather to ‘action’, to the exploits – heroic and not so much – of their central character Odysseus. This artwork, a ‘ready made aided’ (more-or-less), makes a specific point of authorial blindness, a blindness that nevertheless facilitates sight. Here, the well-known marble bust of Homer represented on the cover of this book has had its eyes ‘opened’ by way of drill-holes. 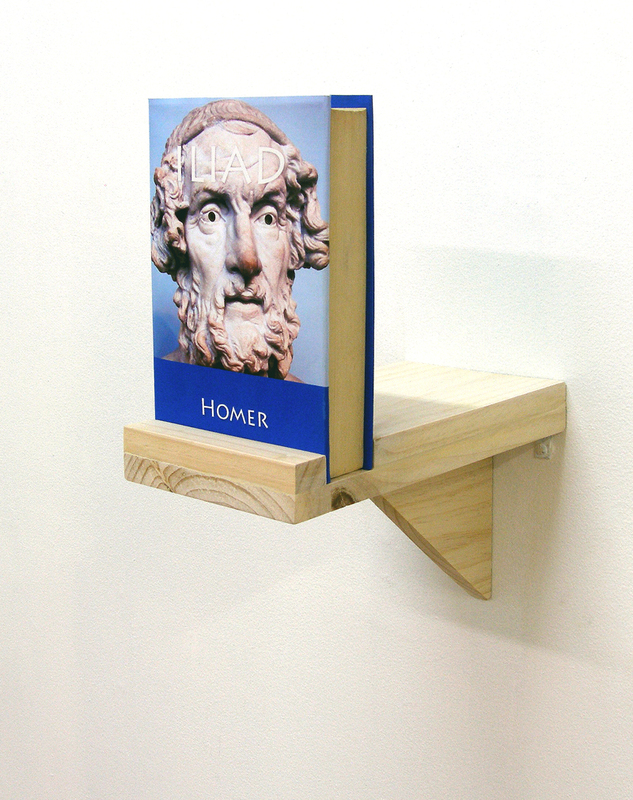 These holes, while figuratively enabling sight – the viewer can now literally see right though the book – actually indicate the blindness that separates us as modern readers from the realities of Homer’s age; we see-though without seeing. At the same time, these circular incisions allow the viewer to re-comprehend a famous text albeit as an object corresponding with Homer’s proto-materialist view of the world. Meanwhile, the slippage between the work’s title and that of the book it incorporates, indicates that ‘The Iliad’ is an odyssey too: by implication, all enduring cultural artifacts have embarked on an odyssey unseen and unknown by their authors.